We provide a fully equipped ambulance which is available around the clock to meet any emergency needs. We have had at least one ambulance available for use for free for the most underprivileged since 2003 and this has saved many lives. Our Ambulance was one of the first vehicles to take seriously injured victims of the 2005 Earthquake to Pakistan. As any vehicle the ambulance has running cost which are met by your donations and we would request that you help as much as you can. It cost approximately £12000 a year to maintain and run the Ambulance. 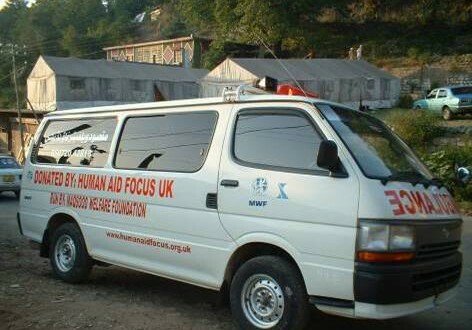 We are also always looking to increase our fleet of ambulances and if you would like to donate a ambulance we can help arrange carriage to Kashmir as well as any legal issues involved, Please contact us on info@humanaidfocus.org.